smartTrade has added Cryptocurrencies to its award-winning FX Trading Platform, LiquidityFX (LFX) and has just won a mandate from SEBA Crypto AG. e-Forex asked David Vincent, CEO of smartTrade about this. In the past 12 month smartTrade has been working on a variety of initiatives. John, smartTrade’s Head of PreSales, discusses crypto opportunities with the Trade News TV. John, smartTrade’s Head of PreSales, discusses on Trade News TV what the challenges are when it comes to selecting a cryptocurrency platform. Why do buy-side clients come to smartTrade to solve their trading challenges? Benjamin Becar, fixed income product manager, talks to TRADE TV at the Fixed Income Leaders Summit 2018. What are the most important criteria for buy-side firms when choosing a trading technology solution? John, smartTrade's Head of PreSales, explains on Trade News TV the main selection criteria for buy-sides when choosing a technology partner. smartTrade Technologies has been chosen by SEBA Crypto AG to deliver state-of-the-art crypto and traditional assets trading platform. How to effectively choose a technology vendor? How to effectively choose a technology vendor? There are two things which you are paramount when you select a technology vendor for your trading business: partnership and transparency. smartTrade Technologies announces that its LiquidityFX platform has gained a highly commended mention for Best Liquidity Aggregation System Provider at the 2018 e-FX Awards. smartTrade Technologies announces that its cross-asset Order Management System (OMS) has been awarded Best Sell-Side OMS at the ITT Summit 2018.
smartTrade Technologies, a multi-asset electronic trading pioneer, was awarded with the Best Liquidity Aggregation Platform Award by Profit & Loss readers. smartTrade Technologies announces today the addition of Cryptocurrencies to its award-winning FX Trading Platform, LiquidityFX (LFX). smartANALYTICS won the RegTech 2018 award for Best Solution for Records Retention voted by members ITT communities. smartTrade announces today the promotion of Annalisa Sarasini from Global Head of Sales to Chief Business Development Officer. smartTrade becomes an official partner of My Padel Tour, the major padel tournament tour in France, which will start on March 17th in Bordeaux. FX Aggregation - Offering access to better liquidity and execution quality read the E-Forex interview with David Vincent, CEO of smartTrade. smartTrade announces strong growth in its number of clients in Fixed Income and FX, and its continued expansion with the opening of a new office in Milan. Quantic Prime, the institutional arm of AFX Group, has partnered with SmartTrade to deliver its solution to the professional and institutional market. smartTrade announces today that BayernLB, a publicly regulated bank based in Munich – Germany, is now live with smartTrade’s LiquidityFX platform. David Vincent, CEO of smartTrade, explains how trading firms can leverage technology not just to achieve regulatory compliance but also to improve their performance. smartTrade Technologies announces that LiquidityFX has been awarded - Best Liquidity Aggregation System of the Year by FX Week. smartTrade Technologies announced today that Sucden Financial has implemented LiquidityFX, smartTrade’s fully hosted FX solution. smartTrade Technologies announces that its cross-asset Smart Order Router (SOR) has been awarded Best Smart Order Routing System by Intelligent Trading Technology Awards 2017. David Vincent, CEO, smartTrade Technologies, explains how currency investors can leverage technology to optimise their trading operations and meet the regulatory obligations. David Vincent, CEO of smartTrade explains how currency investors can leverage technology to optimise their trading operations and meet the regulatory obligations. smartTrade announced today that SBI Liquidity Market complemented its FX platform based on smartTrade’s LiquidityFX, with smartTrade’s award-winning pricing and distribution modules. smartTrade Technologies announces today the launch a new solution smartAnalytics, a cross-asset big data analytics solution. smartTrade announces that LiquidityFX, has been awarded Best e-FX Distribution Platform by the 2016 judging panel of FX Week. smartTrade Technologies has been selected by Bank of China (Hong Kong), a leading regional bank in Hong Kong, to deliver a cutting edge low latency e-FX platform. 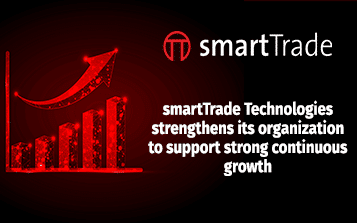 smartTrade Technologies, a leader of multi-asset trading solutions, announces that the company grew globally both in number of new clients and revenue. smartTrade announces today that the company has successfully undergone a Service Organization Control (SOC 2) audit examination. Pragma Securities, an independent provider of quantitative trading technology, has selected smartTrade Technologies, to provide Pragma with an FX liquidity aggregation platform. smartTrade Technologies announces that LiquidityFX solution for buy side, brokers and sell side, has been awarded best liquidity aggregation platform by FX Week. smartTrade Technologies has been appointed to build and host the e-trading platform for R5FX, the new liquidity pool specialising in the trading of emerging market currencies. smartTrade Technologies has been selected by Gaitame.com, a leading Japanese online foreign exchange (FX) trading company. smartTrade Technologies announces today that smart-FI™ was recognized as the best sell-side OTC Trading Initiative at the Sell-Side Technology Awards. smartTrade Technologies has been selected by London Capital Group, a leading provider of online retail and private clients trading services. smartTrade Technologies announces its ongoing expansion into the Asia Pacific region with the opening of a new office in Singapore. smartTrade Technologies announces a new release of its Order Management System (OMS) and adoption by clients in Europe, the Americas and Asia Pacific. FXSpotStream and smartTrade today announced the launch of the 4X|Box, a joint offering. smartTrade announced that LiquidityFX™ was recognized as the best sell-side automated trading platform at the Sell-Side Technology Awards. CMC Markets selected smartTrade’s FX trading solution for FX and precious metals. smartTrade announced that Lalit Nathwani has joined the company as Business Development Director based in London. Bank Vontobel announce a new offering in FX trading for spot, forward and swaps based on smartTrade’s LiquidityFX hosted solution. FXSpotStream LLC today announced the continued expansion of its Service with the addition of Spot Precious Metals price streams and the commencement of client and bank production trading. smartTrade Technologies undertakes a massive recruitment campaign for each of its centers in Aix-en-Provence, New York, London and Tokyo. Annalisa Sarasini, Global Head of Sales at smartTrade Technologies, is shortlisted as “Mentor of the Year” by the “Women of the Future Awards 2013”. FXSpotStream LLC,today announced that it has launched a Desktop Application to enhance its existing API Spot FX price aggregation Service. smartTrade Technologies today announced that Kepler Capital Markets has selected smartTrade’s Liquidity Management System (LMS). Waters Technology today exposed its choice of smartTrade Technologies for its HTML5 front-end and development platform as the “best sell-side web-based. FXSpotStream LLC, a wholly owned subsidiary of LiquidityMatch LLC, today announced that UBS is now live as a liquidity provider bank. smartTrade Technologies today announced that Koscom, leader of financial IT solution in Korea has selected smartTrade’s LMS. smartTrade announces today that SBI Liquidity Market, has selected LiquidityFXTM, smartTrade’s FX trading system. smartTrade Technologies announced today that its HTML5 front-end and development platform was recognized as the best sell-side web-based . Red Herring announced its Top 100 award winners, selecting smartTrade in the financial technology area for its innovation and technology..
smartTrade Technologies has been selected as a Finalist for Red Herring’s Top 100 Europe award. smartTrade Technologies released HTML5-based front end applications for LiquidityFX and the LMS as well as an HTML5 development platform. smartTrade Technologies today announced that MKS (Switzerland) SA (MKS) has selected smartTrade’s Liquidity Management System (LMS). smartTrade announced that Annalisa Sarasini, has assumed the role of Global Head of Sales. Based in London, she will focus on growing global revenue. smartTrade was named winner of this year’s best liquidity management system by FX Week. smartTrade announced the release of LiquidityFX™ – a packaged liquidity aggregation and smart order routing system. FXSpotStream announced the launch of a multibank Spot FX price aggregation service. smartTrade announced that Daiwa Capital Markets has been in production with smartTrade’s smart order routing and dark pool technology for more than a year. smartTrade formally announced a support to Commerzbank on the FX technology. smartTrade announced the release of a white paper and podcast discussing workable approaches to implementing multi-asset and cross-asset trading systems. smartTrade Technologies, an industry leader in cross-asset liquidity management software today announced that Peter Atkinson .